Diving with the deep sea sharks of Cape Eleuthera. First published in Diver Magazine Volume 37, Number 8. Barely a third of the shark species swimming in our oceans will ever be seen by divers. Most live at depths far greater than humans are able to visit without the aid of Exosuits or submersibles. Some are so rarely encountered (even by fishermen) that they have been scientifically described from only one or two specimens swept up in exploratory deepwater trawls. What goes on in their lightless world is a great mystery that scientists are finally starting to unravel. Researcher Edd Brooks from Cape Eleuthera Institute’s Shark Monitoring Program has spent the last few years studying the composition and migratory movements of shallow water shark species within the Bahamas. In 2010, under the guidance of Dr Dean Grubbs from Florida State University, Edd and his team started looking at deeper dwelling shark species. Located on the edge of the 1500m deep Exuma Sound, Cape Eleuthera is an ideal spot for studying deep-water habitats. Due to the steepness of the underwater terrain, one can jump in a skiff and reach water that is 1000 meters deep, just 10 minutes from the CEI campus. So far, the study has concentrated on simply figuring out which species inhabit the area and their relative abundance to one another, but Edd has also been collecting blood samples to measure the stress response of captured animals and he has placed a number of satellite tags (supplied by Lucey Howey of Microwave Telemetry Inc) to track the released sharks’ movements. Edd and his interns have been dropping longlines in the mesopelagic zone (between 200 and 700m deep) and the bathypelagic zone (700m+) with assorted hook sizes designed to catch sharks of all calibers. Considering the inhospitable nature of their abyssal environment, the number and variety of sharks that they have brought to the surface is quite impressive. To date, the study has identified nine different deepwater species ranging from tiny cat sharks and gulper sharks to enormous bigeye and bluntnose sixgills. By analyzing the satellite tag data, Edd has established that Bahamian Bluntnose sixgills (Hexancus griseus) undergo nightly vertical migrations towards the surface but they still remain deep compared to populations in the Pacific Northwest. In Puget Sound and around Vancouver Island, these same 5m long behemoths occasionally enter shallow bays to the delight of surprised scuba divers. Perhaps because of their larger, more sensitive eyes, bigeye sixgill sharks (Hexanchus nakamurai) are never seen within recreational diving limits. Another shark that thrives in the mesopelagic (and quite often falls prey to hungry sixgills) is the Cuban dogfish (Squalus cubensis). Cubans are one of the most abundant shark species in the twilit depths of the Northern Caribbean. 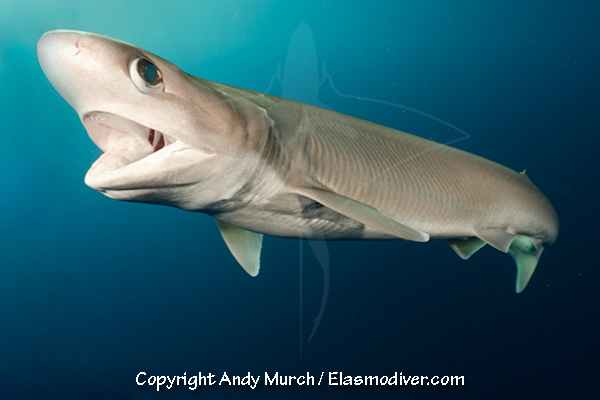 Like spiny dogfish (their temperate water cousins) they form dense schools that scour the depths in search of food. 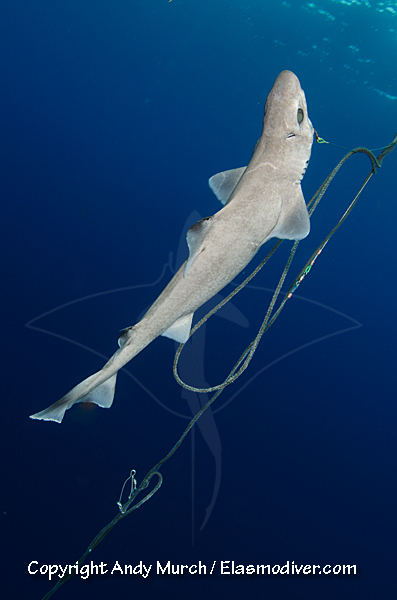 At depths where Cuban dogfish fear to tread, the dominant small predators appear to be gulper sharks. 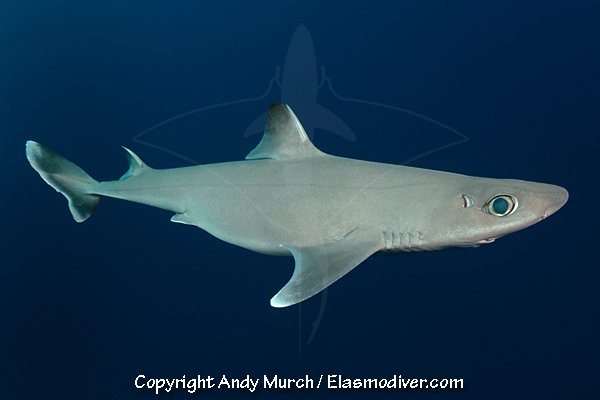 So far, Edd has found two species of gulpers in the Exuma Sound – the common gulper shark (Centrophorus granulosus) and what may be the Taiwan gulper shark (Centrophorus niaukang) but its identification has yet to be confirmed and there is a chance that it could represent an undescribed species. To find out, a tiny fin clip is taken from each shark and sent to Dr Demian Chapman; a Geneticist at Stony Brook University. Dr Chapman compares the DNA in the clips with other samples collected from all over the world. It is a painstaking task that is complicated by the fact that the gulper shark family (Centrophoridae) is presently under review. In other words, some of the currently recognized species could eventually be discounted as geographical variants of each other. Others will likely be split into multiple species. It’s a deep-sea jigsaw puzzle that may never be totally completed. Although Ed’s gulpers live at tropical latitudes, the bathypelagic zone that they mostly inhabit, is as cold as arctic seas. Consequently, by the time they reach the surface they are overcome with heat exhaustion. Combined with what must be blindingly bright conditions for their ultra sensitive eyes, they are invariably disoriented from their ordeal and cannot make the long swim back to the depths without assistance. Once Edd’s team has gathered all the information that they quickly can, one of his interns slips into the sea and swims the ailing shark back to cooler, darker climbs where it can hopefully continue downward under its own steam. It’s a fun part of the job but gulpers are not exactly cuddly sharks. When handled, they exude copious amounts of a viscous fluid from their skin that sticks to everything it touches. The composition of the mucus has yet to be determined but its release is probably an anti-predation mechanism. The material may taste particularly bad to predators or it may be designed to clog their gills and encourage them to eject their would-be lunch. Deep ocean hagfishes have been recorded employing similar defense techniques in other areas of the world. Among deepwater species, common gulpers are particularly vulnerable to depletion because they mature extremely slowly, have very long gestation times, take rest gaps in between pregnancies and usually give birth to just a single offspring. Although virtually all shark fisheries are unsustainable, deepwater sharks are even less resilient. 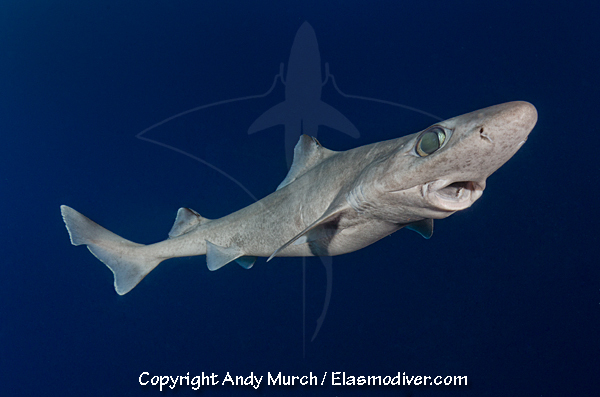 Unfortunately there is a growing market for deep-sea shark liver oil and regardless of their inability to cope with fishing pressure, gulper sharks are one of the targeted species. As glamorous as working on a shark research boat may sound, repeatedly pulling a mile of weighted rope from the seabed soon becomes an onerous task. Fortunately for Ed’s interns, there is no shortage of eager hands on the line because CEI is more than just a centre for scientific study. ‘The Island School’ is a key component of the Institute’s holistic approach to scientific learning. Each semester, 48 enthusiastic teenagers from all over the globe come to Cape Eleuthera for a crash course in marine science. 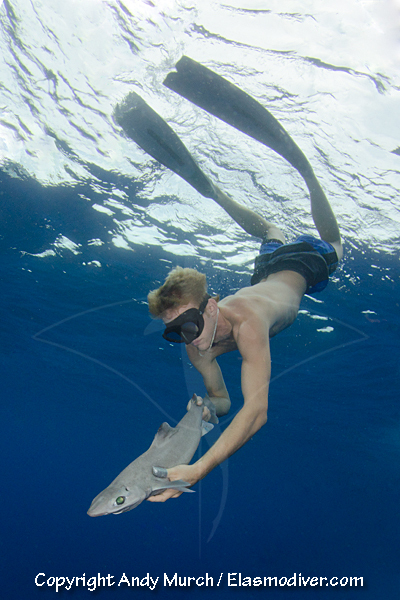 Between diving lessons, kayaking expeditions and more traditional academic classes, the students have an opportunity to assist in a variety of hands-on scientific projects such as patch reef ecology, offshore aquaculture, lionfish monitoring, tropical flats ecology and the deep shark monitoring project. There are also a number of terrestrial projects underway including an aquaponics program and the construction of a biodigester that will eventually recycle waste to produce bio-gas and nutrient rich fertilizers for the institute. Now that Edd has gathered enough baseline data from the steeply sloped region beyond the reef, he has begun dropping lines even further from shore. Poor initial returns suggest that there are fewer sharks swimming over the muddy plain than there are cruising along the rocky incline closer to the coast. This makes sense as there is probably a better food supply for the sharks in areas where a complex web of invertebrate and fish life is able to take root. Once he confirms that most abyssal sharks are loosely confined to a relatively thin strip of ocean fringing the island, that data can be used to create MPAs (Marine Protected Areas) on the grounds that the slope is a critical habitat for vulnerable deep-sea species. The next stage of the project will be to establish what else is down there. There has been surprisingly little bycatch on the baited lines and identifying anything from stomach content analysis is tricky when the majority of shark’s stomachs are filled with nothing more than noxious brown goo. By installing baited video cameras and utilizing light traps, Edd hopes to gain an insight into the interdependencies between the various deep-sea life forms that inhabit the region. Figuring out who eats who, is the best way to determine what the fall out would be if the sharks are allowed to disappear completely.